As the pills took hold of my internal (bodily) Garbage Collector and tuned it to more efficiently remove unneeded and unwanted objects, TheHackerCIO's thought naturally turned to his beloved JVM and it's own GC algorithms. 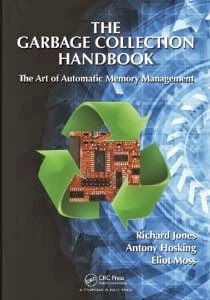 For those more managerial, Garbage collection is part of the major advantage of Java over the old C and C++ environments. It allows the programmer to depend upon the environment to manage memory, rather than having to explicitly perform this in code. GC is an important issue in todays world, and I had been unsatisfied by the Java Performance book our Geeky Book Club read recently, most specifically by it's treatment of the GC algorithms. It seemed to be poorly organized from the standpoint of fundamental types of GC. Instead it plunged right in to the present state of GC available. I was confirmed in this opinion by hearing a wonderful talk by Azul, who make a for-purchase JVM built around the idea of a "pauseless GC." In other words, in most GCs, when you collect the garbage, all work must stop. This is called "Stop the World," because all threads doing application work are stopped while the GC "pauses," collects the garbage, reclaims memory for new use, and then restarts the application. If the heap is big, a pause could be long. Maybe seconds. Maybe even 4-5 seconds? Now your talking availability problems! Consequently, the GC needs to be understood. And tuned. So naturally, I ordered a copy. The book is wonderful. I'm only on chapter two, but even if difficult/demanding, since it's well organized and doesn't leave dangling questions, it's a far better resource to read first, before attempting the Java Performance book, already reviewed here. Plus, this is the absolute latest update on GC algorithms and technology! Further details will follow.